Use book shelves to define spaces as well as add extra storage. Add hidden storage to a breakfast nook (or any other nook in the home) with this amazing storage bench. These vintage lockers inspired by Pottery Barn can be built to fit any corner. This diy storage ottoman not only provides storage but it's also a great place to prop your feet up after a long day and can provide extra seating as well. These diy plans not only add storage to the wall behind the bed but there is also hidden storage under the bed as well. Build some sturdy shelve in the garage or basement. Using plastic bins will also keep bugs and mice out. Great ideas!! I would love for you to link up at my new Work it Wednesday Linky Party!! 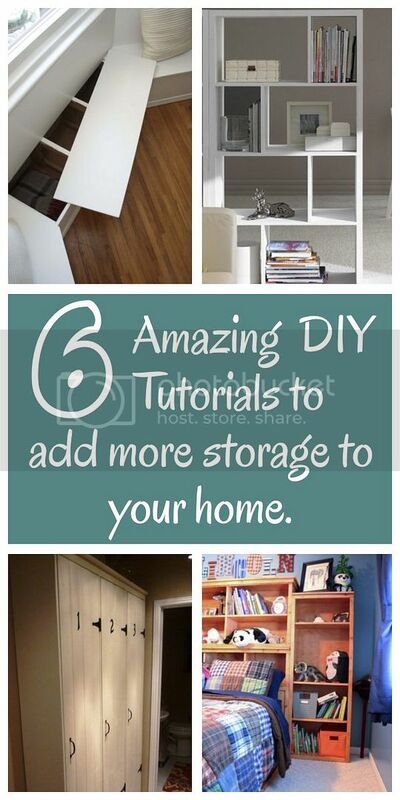 There are various ways on how to add more storage at home. I met a client once at the self storage Gold Coast exhibition. He runs his own blog about self storage and portable storage, and the ideas he shared with me are simple and doable. These are ideas that we have already thought of before, but did not bother exploring. It is amazing how the human mind can simplify it and make it easier for the rest to do. Thank you for giving the tips of storing the items in house. This tips will help me a lot in storing my items in house. Actually, I was planning to store all my items in the storage unit. This is great! anyone take a research before storing item and stuff to a storage unit but I already rent a self storage in stor-n-lock redlands/mentone company before I read your wonderful idea, but I can apply your ideas to my storage unit, thanks for posting your idea, keep up the good work! Sometimes, if we really pay attention to the spaces at home, we might find rare gems of storage spaces that we really haven’t utilized and even maximized. I would suggest to make a survey of your home, throw away the clutter, and see if you can remodel the space to make room for storage. I would love for you to link up at my new Work it Wednesday Linky Party ...!! !